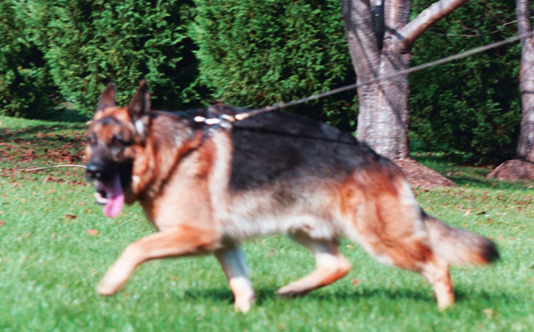 The German Shepherd Dog should have a trotting gait, with the hindquarter thrusted well forward of the mid-point of the body and the front having an equally long reach without any noticeable change in the back line. The gait should produce a ground covering stride with the impression of effortless movement. The base color should be black with markings of brown, red-brown, blonde, and light grey. It could also be grey with clouds of black markings and a black saddle and mask. The weight of the males should be between 30 to 40 kgs. and of the females between 22 to 32 kgs.